Rashes that develop after eating meat may be a sign of a hypersensitivity to the proteins found in the meat. Food allergies are mostly caused by foods like milk, fish and nuts, but in some cases the proteins in meat may trigger an allergic reaction. If you develop a skin rash every time you eat meat protein, have your doctor evaluate your skin condition to determine the cause. ABC News reports that meat allergies may be more common than the medical community once thought. 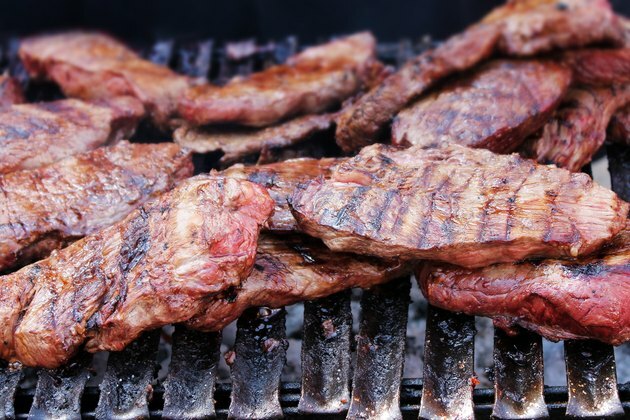 Meat allergies occur when your body's immune system mistakes the proteins in the meat as harmful to the body. The immune system protects the body by creating disease-fighting agents called antibodies. Antibodies work to fight off the meat proteins, but trigger the release of histamine in soft tissues. Histamine is a chemical in the body to prevent infection, but too much histamine leads to inflammation, irritation and increased mucus production. Meat allergies can trigger minor to severe symptoms within minutes of ingesting the meat. When the body is fighting against meat proteins, the increased amount of histamine causes blood vessels to dilate, creating inflammation and instability in the skin. Rashes are one of the first signs of a food allergy and may develop anywhere on the body. Common skin rashes associated with sensitivity to meat proteins are hives and eczema. Hives form as red welts on the surface of skin with flat surfaces and defined borders. Hives are harmless unless they develop in your throat and cut off your ability to breathe, according to the American Academy of Allergy, Asthma and Immunology. Eczema is a skin condition that is triggered by hypersensitivity that causes fluid-filled bumps to form typically on your face, arms and legs. To confirm and clinically diagnose your condition, your allergist will perform tests to confirm meat protein hypersensitivity. Proteins from the meat are exposed to your skin in a localized area to determine whether or not the skin is affected. If within 15 minutes your skin becomes red, bumpy or inflamed, your doctor will want to confirm her speculation of an allergy with a blood test. It's possible that you may have an allergy to another food you commonly eat with meat. Keep a food journal that documents everything you eat and any reactions you have after eating. This can help your doctor determine which foods to test for sensitivity. Common food allergies include eggs, milk, soy, wheat, fish, tree nuts and nuts, according to MayoClinc.com. Why Does Red Meat Give Me Diarrhea? Is Meat or Poultry Included in the Glycemic Index?